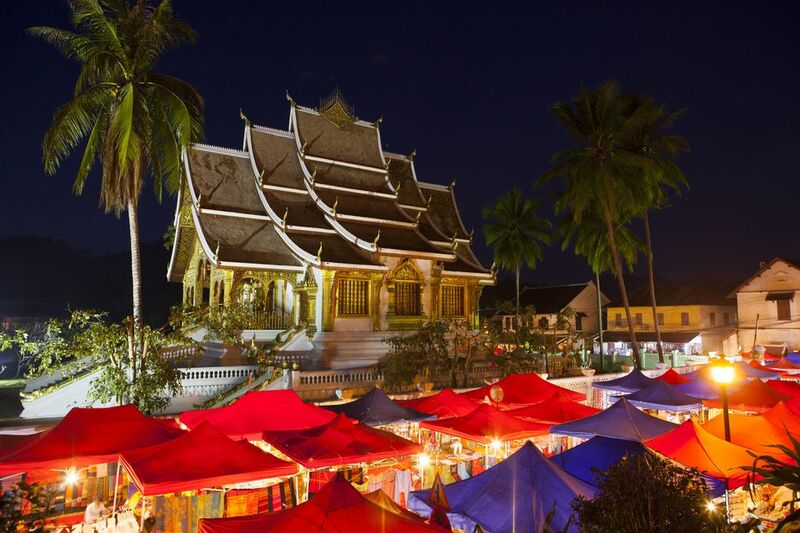 Jaded travelers in Southeast Asia will be surprised at how... relaxed it feels at the Luang Prabang Night Market in Laos. Compared to the high-pressure touts and crush of crowds you’ll experience at retail districts elsewhere (Hanoi’s Old Quarter and Bangkok’s Chatuchak Market come to mind), the Night Market feels rather easy-going. The market’s Hmong and Lao vendors sit on mats with their wares spread around them, engaging tourists with bonhomie without the insistent guilt-tripping of their counterparts in the rest of the region. And unlike most grassroots markets in the region, this market offers a fair proportion of authentic, locally-made goods — Luang Prabang, after all, was long a trade crossroads, set by the Mekong River within easy boating distance from villages around the countryside. The Luang Prabang Night Market takes place every night, right in the center of town at Sisavangvong Road, beginning at the post office/junction of Kingkitsalat Road and ending just after the National Museum. For the duration of the Night Market, this stretch of Sisavangvong Road is blocked to traffic. The individual market stalls begin to set up by 4 p.m., and by 5 p.m. most stalls are ready to do business until the market’s 10 p.m. closing time. If you’re not staying in Luang Prabang’s historic quarter (from which reaching the Night Market is simply a matter of walking to either end), you’ll likely be taken by car or tuk-tuk to the Kingkitsalat Road junction, from which you can walk and explore at your leisure. Safety for shoppers: Luang Prabang is generally safe, with little danger aside from pickpockets or the rare opportunistic theft. The usual precautions — keeping your belongings close, situational awareness — will do. Luang Prabang’s past and its present come together in the Night Market’s merchandise — reflecting the town’s history as a junction for trade and politics in this part of Southeast Asia, and the surfeit of cheap Chinese-made goods from just over the border. Hmong and Tai vendors come in droves every afternoon, bringing hand-woven indigo-dyed fabrics from home-based looms. Luang Prabang citizens counter by bring silks and handicrafts. Enterprising crafters cannibalize metal from bombs and other ordnance left over from the Vietnam War, recycling them into bottle openers, jewelry and assorted gewgaws. The improbable assortment of local and imported goods on offer — including paintings, coffee beans, spices, shoes, bags, jewelry, pottery, wood carvings, T-shirts, skirts, toys, scarves, and underwear — all come at a surprisingly low cost, fetching prices easily half that of comparable goods in night markets elsewhere. Bring your own shopping bags. Southeast Asia has a massive plastic pollution problem, and by taking the vendors’ single-use plastic bags for your purchases, you help make the problem worse. Bring your own reusable shopping bag, and stop adding to buildup of trash. Look for the Handmade in Luang Prabang sticker. Local artisans banded together in 2012 to create a mark of quality for their authentic Lao handicrafts. The circular Handmade in Luang Prabang sticker can be found on Night Market goods proudly created by locals, including pottery, silver jewelry, lacquerware, silks and cotton scarves. The sticker’s presence assures the buyer of the item’s high quality and authentic make. Lao food bargains line a narrow alley just off the Night Market entrance — positioned just right for visitors who want to start their shopping evening with a meal, or for tired shoppers looking for a bite just before going back to their hotels. Stalls sell cooked food a la carte, and buffet-style meals, all served on makeshift tables and benches along the alley, leaving just enough room for visitors to squeeze through in the middle. Roasted meats: The Lao are old hands at barbecues, to go by the ample amounts of ping kai (roast chicken) and ping pa (roast river fish) sold in the food street. Each serving is cooked as you order — skewered or clamped by bamboo sticks over glowing charcoal, then served piping-hot. Lao sausages: Luang Prabang’s take on Lao sausages involve a healthy helping of fatty pork and sticky rice flavored with herbs and chilies. Coconut pancakes: Tiny platefuls of khao nom krok are made and sold just outside the food street, served freshly-cooked and piping-hot in threes on banana-leaf plates. If you’re looking for a cheap pick-me-up, an added boost of sugar that won’t interrupt your shopping, look no further. Vegetarian food: In the land of the papaya salad (tam mak houng), it should be no surprise that vegetarians have plenty of options in Luang Prabang’s food street. Two different vegetarian stalls sell all-you-can-eat buffet options for as little as LAK 15,000 (about $1.75) per plate. Fruit shakes: The Market’s most visible drinks stalls can be found on the opposite end of the street from the food alley — the corner in front of the National Museum hosts vendors selling shakes made from fruits like mango, dragonfruit, and limes. These stalls are perfectly positioned to offer post-shopping refreshments for tired tourists.